Foil packets meals are trending lately and they are great for camping. The concept is simple and the variety is only limited to your imagination. They can be made ahead and placed on the grill or campfire when you are ready to eat. Since all of your work is done up front you can have the day to do other things you enjoy around the campground. They are one-packet meals and can be made up for breakfast, dinner, or even dessert. You place the food you are planning to eat inside a square of tinfoil. Be sure to use heavy duty foil or double-wrap regular foil so your packets won’t leak or tear easily. You can cook chicken and vegetables, steak and potatoes, fish and rice, or peaches and brown sugar. All of it gets wrapped up in a tidy packet of foil and cooked to feed as many as you’d like. Clean up is a breeze so that is one more chore you won’t have to spend time on while enjoying your vacation. 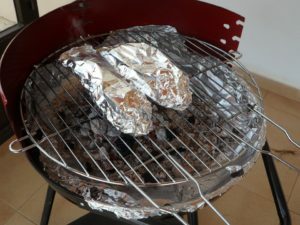 You can find some delicious recipes at 50 Things to Grill in Foil. We hope you’ll give them a try so that you have less work and more fun during your camping stay.